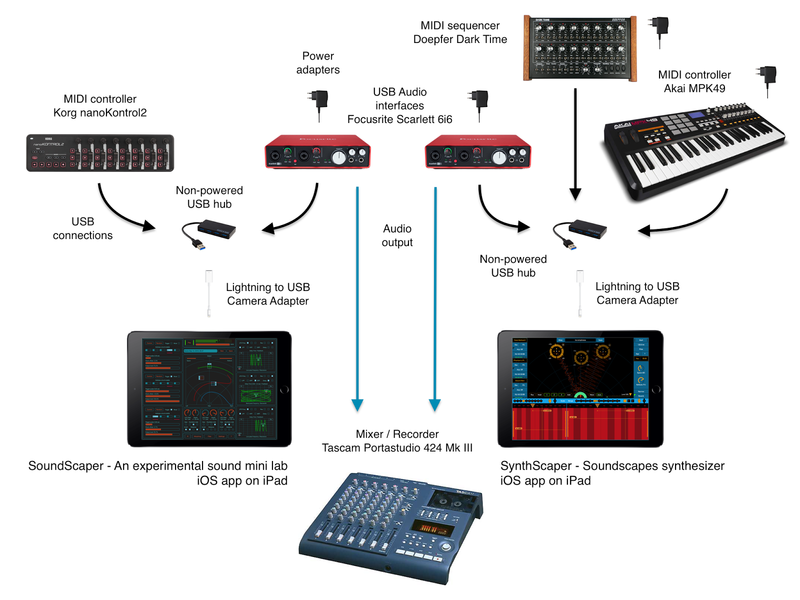 SoundScaper - An experimental sound mini lab. Control from Korg nanoKontrol2. Used for intro and effect sounds. 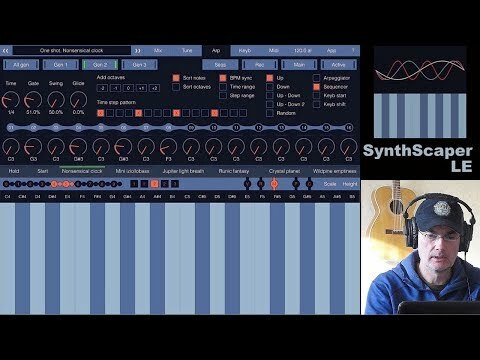 SynthScaper - Soundscapes synthesizer. Control from Akai MPK49 for all oscillators (main MIDI source in app). Sequences send from Doepfer Dark Time for third oscillator (alter MIDI source in app). First oscillator configured for noise in the final part. Pad playing on second oscillator. Two stereo outputs recorded on Tascam Portastudio 424 Mk III, mixed and added to video and as separate track. All devices (except Korg nanoKontrol2) have own power supplies and connected to iPad thru non-powered USB hub. FieldScaper live improvisation (FieldScaper app on iPad with MIDI controller, hardware synths and also with description of setup). FieldScaper - Advanced field recorder combined with a sound warp engine and a collection of ready to use dynamic presets for iPad and iPhone. Discover new ways to create and construct unusual and exciting sounds from any environmental audio recordings or samples recorded from other apps. FieldScaper ver. 1.8 has been released!